Aren’t you sick and tired of having all of your metrics scattered across several cluttered reports, or spending hours copy-pasting your data from one sheet to another? 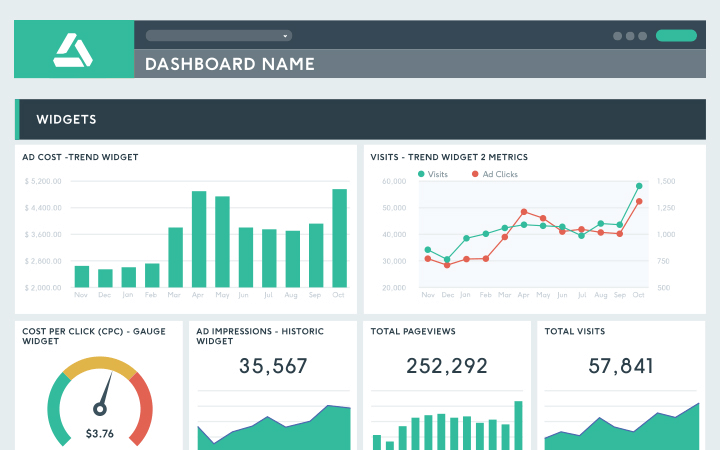 Then DashThis is the KPI dashboard tool you’ll love us for. Select the platforms you wanna link your dashboard to, enter your credentials, and say hi to your new life. Sounds too good to be true? It’s not. Here at DashThis, we are fully dedicated to making your dashboard and report creation simple, intuitive, and automated. Grab a cocktail, put your feet up, and chill. We got this. Whether you want to add your logo (or your client’s) to your dashboard, write down comments, or merge data into a single widget, DashThis offers the customization options you need to make a KPI dashboard your own. Referring back to a few months-old or even years-old report has never been easier. DashThis allows you to look over your data’s progression for any given period of time. No more copying and pasting metrics until you can’t see clearly anymore; all the data you need is in there, within easy reach. You’re already tracking all the KPIs you need to make the most out of your marketing strategy. Be it Facebook ad clicks, Instagram impressions, or bounce rates, DashThis regroups all your KPIs in a single dashboard. Use our preset widgets or customize them to extract and read data the way that suits you best. KPI Reporting is time-consuming and can be a real pain in the neck, and yet we know how necessary it is. Among many others, these agencies have chosen to trust us with this incredibly important task. DashThis has proven to be a crucial tool used to make the whole reporting process painless and give agencies the extra time they need to grow their business. See for yourself! We want your KPI dashboard creation to go as smoothly as possible, and that’s why we provide you with the features you need. A customizable tool you’ll quickly master without bothering your IT specialist: that’s what we have to offer. Neat, uh? How much is DashThis worth to your company? Look at the time your employees spend on each KPI dashboard they have to produce; how much money do you pay for that? With DashThis, you get extra time on your hands and extra money in your pocket, while we take care of what we’re best at: reporting. That’s what we call a win-win! Plus, not to brag or anything, but our first-rate customer service is totally out of this world. Want a fully custom Facebook Ads report that looks like your brand? Our designers would be happy to create one for you! Save on a custom URL and design with a white label bundle that includes both! A KPI dashboard just the way you want! Traffic, Time on Site, CTR, Conversion Path, Bounce Rate… Your clients’ websites undoubtedly involve a whole lot of data you need to constantly keep track of. With a Google Analytics report template, gather all your clients’ website data in a single, nice-looking Google Analytics KPI dashboard and start reporting in no time! Read our blog to know more about our dashboards! Our blog is always a great place to find tips of the dashboarding trade, as well as information on our product and updates. You can also sign up for our newsletter to get the latest info!